Title contains is activated when a job title contains a specific word or text. Page count exceeds is activated when a job contains more than a specified number of pages, and can be used to notify the administrator of a large printed document. 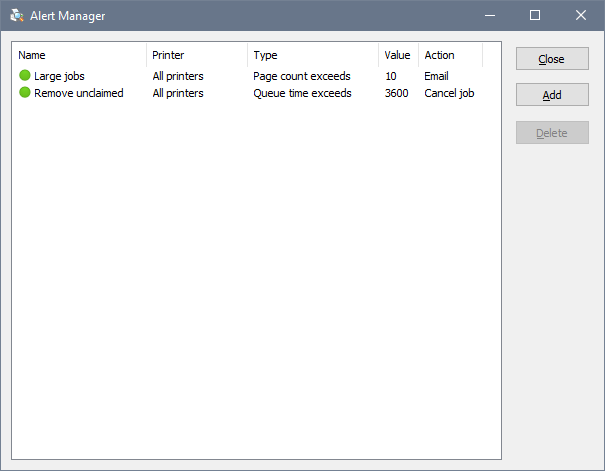 Queue time exceeds is activated when a job has been in the queue for a long period of time, and can be used to notify the administrator of a jammed printer or to remove unclaimed jobs. Submitted by user is activated when a job is submitted by a user whose name is specified in the alert. 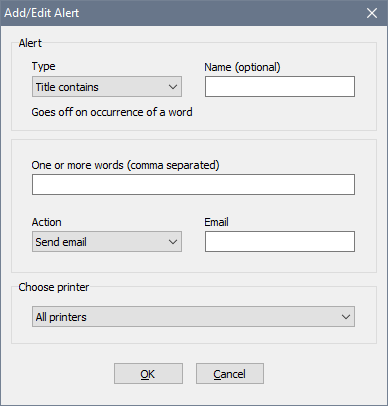 Submitted by computer is activated when a job is originated from a computer whose name is specified in the alert. Send email. To send emails, you need to specify your SMTP server details in the global settings. Launch application. The application will be launched from a system account on a separate desktop, so make sure it requires no user input or it will stall. Cancel job. A job that activated the alert will be deleted from the queue. If it cannot be deleted for some reason, a message will be written in the event log.